1 Pontifical Catholic University of São Paulo (PUCSP), Sorocaba, SP, Brazil. 2 Federal University of Juiz de Fora (UFJF), School of Medicine, Juiz de Fora, MG, Brazil. Background: Studies on “Spirituality, religion and health” (R/S) have been increasing worldwide, including in Brazil. Mapping this production can help researchers to understand this field and also to identify gaps in the Brazilian R/S studies. Objective: To analyze the Brazilian scientific articles on “Religion, Spirituality and Health” available on the main electronic databases using a bibliometric approach. Methods: A comprehensive review of four major databases (PubMed, Scopus, BVS and Web of Science) was conducted. Three reviewers performed the data analysis. Off-topic articles, articles from Portugal, books and thesis were excluded. Articles were then classified by: Publication year, journal, Central focus in R/S, Academic Area, Main topic and Study Type. Results: From 3,963 articles found, 686 studies were included in the final analysis (320 had central focus on R/S). There was an increase of articles in the last decade (most observational), with predominance of mental health issues, and from journals in the field of psychiatry, public health and nursing. Discussion: This study enabled us to widen our understanding about how the field of “spirituality, religion and health” has been established and how this field is increasing in Brazil. These findings can help in the development of future Brazilian studies. 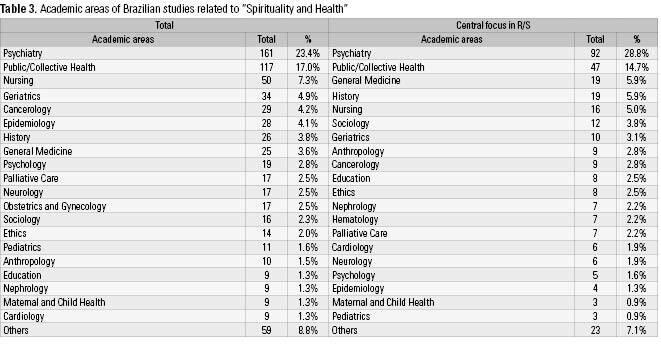 Keywords: Spirituality, religion and medicine, bibliometrics, statistics and numerical data, publications. Although there is no consensual definition, spirituality can be described as “the personal quest for understanding answers to ultimate questions about life, about meaning and about relationship to the sacred or transcendent, which may (or may not) lead to or arise from the development of religious rituals and the formation of community”. And religion may be defined as “an organized system of beliefs, practices, rituals, and symbols designed to facilitate closeness to the sacred or transcendent (God, higher power, or ultimate truth/reality)”1,2. Over the last decades, studies in the field of religion/spirituality (R/S) and health are growing substantially3. This growth has been widely seen throughout the world, with Brazil being one of the most significant countries with regard of this expansion4. In a recent PubMed bibliometric analysis4, reviewing the last 15 years of publications in R/S field, authors found a three-fold increase in the number of articles from 1999 to 2013. According to a recent systematic review3, 80% of all studies in this field involve mental health studies. This relationship between spirituality and mental health has been widely demonstrated by many different authors over the years and all around the world5-9, usually showing lower rates of drug use, lower prevalence of depression and suicidal attempts and better quality of life and well being. Likewise, there is also a relationship between R/S and physical health, such as less hospitalization, better coping with the disease, better treatment adherence, more acceptance of therapeutic measures, and lower mortality rates10-12. Although less frequent, there are also negative outcomes of some forms of religious involvement, such as extrinsic religiosity and negative religious coping1,9. In view of this evidence, R/S studies in health have progressively become a topic of interest for different academic and professional societies, groups and researchers all over the world5. Likewise, this content has been included in the curricula of many universities (90% of US medical schools, 59% of British medical schools and 40% in Brazil)13,14. In Brazil, a multicenter study with 3,630 medical students showed a large gap between high levels of students’ desire to receive training in R/S and the actual low rates of medical training received on the topic14. Thus, reviewing publications in this area is also crucial to address the increasing demand of bibliographic resources on R/S among medical students and professionals. 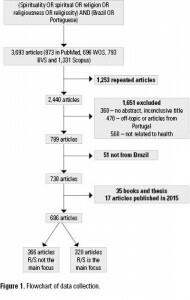 Within this context, mapping the Brazilian production in this field, including the most common areas and lines of research, the type of articles, the evolution of the field over the years and the most relevant journals, can help researchers and clinicians to understand this field and also to identify gaps in the Brazilian R/S studies. However, even though we have identified some attempts to evaluate Brazilian R/S production4,8, to our knowledge, there is no specific bibliometric analysis up to the present date. Therefore, the present study aims to analyze Brazilian studies on “Religion, Spirituality and Health” available on the main electronic databases using a bibliometric approach. This will allow us to provide a wider panorama about how R/S in health have been scientifically studied throughout the decades and what are the main gaps and challenges in this field, fostering the development of further studies and creating new ideas of research in this area. 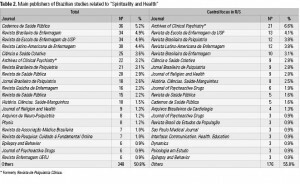 A bibliometric analysis was carried out aiming to evaluate all Brazilian scientific articles related to “Spirituality, religion and health”. A comprehensive review of four major electronic databases (PubMed/Medline, Scopus, Web of Science and BVS – “Biblioteca Virtual em Saúde”) was conducted. BVS was chosen because it includes a lot of Brazilian articles and embraces some important Latin American databases, such as LILACS (Literatura Latino-Americana e do Caribe em Ciências da Saúde) and SciELO (Scientific Electronic Library Online). The Boolean expression “(Spirituality OR Spiritual OR Religion OR Religiousness OR Religiosity) AND (Brazil OR Portuguese)” was created to help the search in these databases. The inclusion criteria were all articles (without date restrictions) evaluating or discussing the association between spirituality, religion, religiosity and spiritual/religious practices or interventions with health. The exclusion criteria were: articles without abstract and with inconclusive title, articles off-topic, articles from Portugal, articles not related to health and redundant publications. Figure 1. Flowchart of data collection. The data extraction is detailed in Figure 1. Data was extracted from each database (May 31st 2015) and inserted into Excel spreadsheets. Then, we created only one Excel file with all the included databases. As we did not limit the period of analysis, all articles were checked and then included into the review. In this part, some repeated articles were excluded prior to send to review. Three independent researchers did the review without any contact during the period of analysis. A meeting to discuss the criteria for inclusion and exclusion was held previously among all authors, including those who performed the review. A sheet with all established criteria was written and sent by email for all authors, guiding their review process. Each reviewer first classified the articles as Included/Excluded, and if excluded, the Reason for Exclusion, as described in the previous section. The second analysis consisted of classifying the articles in other 5 areas: Author from a Brazilian institution (we considered any author position); if the article has the central focus in R/S; Academic area; Main topic; and Study type. The reason to classify again the author’s country is to exclude any article that was wrongly selected to the second analysis. In the end of analyzes, all included articles (excluding all articles without any author based in Brazil) were classified in the following variables: Year of Publication and Journal (both given by databases), Central focus (if R/S was the central focus of the manuscript. For example, some articles investigated several variables, including religion. However, this was not the focus of the manuscript), Academic Area, Main topic, and Study Type. All three reviewers did each analysis in separate files; therefore one of the three authors was selected to join all three outcomes in only one file to facilitate the consensus. This final Excel file was done joining all three outcomes for each article subsequently. Afterward, the same author reviewed this file trying to find a consensus for each variable of each article. For articles in which at least two out of three reviewers classified the same, the majority was selected. However, for articles in which there was no consensus, the final reviewer made the decision. An observer intra-class correlation (ICC) was calculated for the first twenty-five articles in order to assure consistency (ICC = 0.72, confidence interval – CI 95% 0.42-0.88). Then, results were discussed between all authors. Another observer intra-class correlation was performed in the end of analyzes (2,440 articles), showing a high agreement rate (ICC = 0.83, CI 95%: 0.82-0.84). After the final consensus was reached, a final Excel file was sent for all authors. The last stage of our study was to perform the last review and analyze all final data. The other authors who did not participate of the first classification were responsible for reviewing and statistical analyses. At this point, some articles were excluded because did not fill the inclusion criteria. 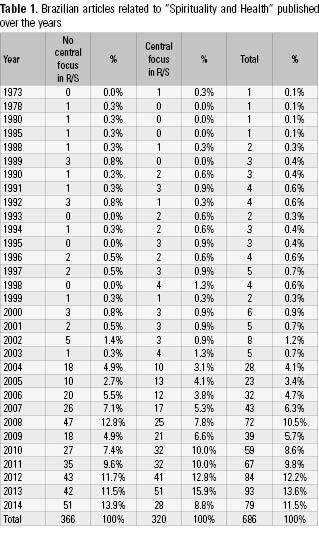 Since we finished the analysis in the middle of 2015, all articles from the same year were withdrawn for not making a comparison across years possible. Then, descriptive statistic was done to analyze each studied variable. Figure 1 presents our data extraction based on the PRISMA Flowchart. In our first search using the boolean expression, we found 3,693 articles in all four databases (873 in PubMed, 696 in Web of Science, 793 in “Biblioteca Virtual de Saúde”, and 1,331 in SCOPUS). In this step we excluded 1,253 repeated articles prior to send to the review. Then, 2440 articles were evaluated by three reviewers. 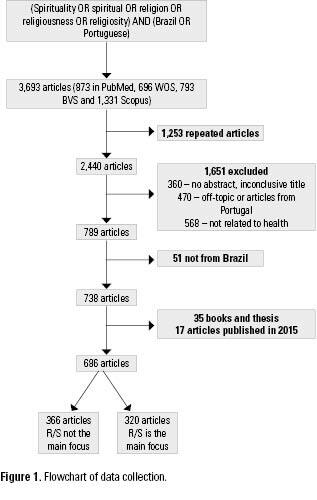 After reaching a final consensus, 1,651 articles were excluded (360 with no abstract and inconclusive title; 470 off-topic or articles from Portugal; 568 not related to health; and 253 repeated articles). Then, 789 articles were included and sent to the last review. At this point, 51 articles were excluded for not being from Brazil, and 35 books and thesis were also withdrawn. Moreover, 17 articles published in 2015 were excluded in order to make the analysis over years possible. 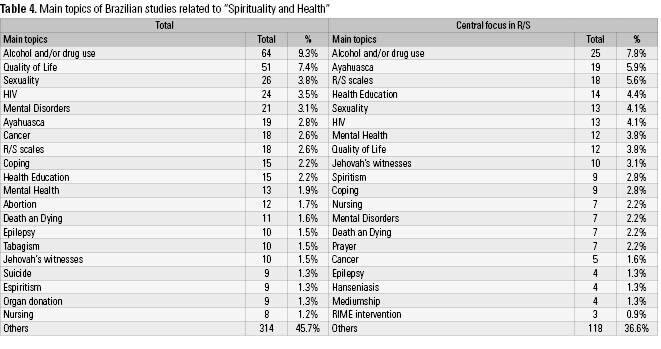 Hence, 686 articles, corresponding to all Brazilian production related to “spirituality, religion and health”, were included in the final analysis. From these, 320 out of 686 articles (46.6%) had R/S as the main focus (Table 1). Table 1 also presents the evolution of R/S publications of Brazilian articles over the years. We found that the first publication was in 1973 and, since then, a slow increase in the number of articles over the years can be observed. It is noteworthy that there was an “explosion” of publications happening between 2003/2004, with 2004 having five times as much the amount of articles in R/S published in the previous year. This “explosion” of articles in 2003/2004 can also be seen in graphic 1, which reveals a constant increase in number until 2014, when we see a decrease, especially in articles with central focus in R/S. Table 2 presents the Brazilian journals that most often published articles related to R/S and health. Concerning all articles related to R/S and health, “Cadernos de Saúde Pública” (a Public Health Journal) leads the production, followed by three nursing journals. Concerning only articles with central focus in R/S and health we found an important leading for “Revista de Psiquiatria Clínica”/Archives of Clinical Psychiatry, followed by a nursing journal and then by another psychiatry journal, showing a dominance of psychiatry journals in publications of articles with central focus in R/S and health. Table 3 shows the main academic areas of Brazilian studies related to R/S and Health. As we could predict, the main area is Psychiatry, leading both the total of studies and also studies with central focus in R/S. However, we also see an important amount of studies published in Public Health area, which holds the second place in both views. Considering only studies with Central focus in R/S, both Psychiatry and Public health areas correspond to almost 44% of all studies in Brazil. Nursing also represents an important amount, with 7% in the total of studies. Concerning the Main Topics of studies (Table 4), there is a small difference between all articles and those that are focused in R/S and health. The five main topics when analyzing all articles are “Alcohol and/or Drug Use” (9.3%), “Quality of Life” (7.4%), “Sexuality” (3.8%), “HIV” (3.5%), and “Mental Disorders” (3.1%); however for articles focused in R/S the five main topics are “Alcohol and/or Drug Use” (7.8%), “Ayahuasca” (5.9%), “R/S Scales” (5.6%), “Health Education” (4.4%), and “Sexuality” (4.1%). Thus, “Alcohol and/or Drug Use” showed as being an important subject for R/S studies. Finally, we evaluated the study type for each article. In the total R/S studies, the most common type of study was observational quantitative studies (Cross-sectionals, Cohort, and Case-Control Studies) (47.7%), followed by Qualitative Studies (32.6%); Narrative Reviews (12.7%); Editorial, Letter to Editor, Proceedings (3.3%); Systematic Reviews (2%); Quasi Experimental Studies (0.9%); and Clinical Trials (0.6%). Regarding only studies with Central Focus in R/S and Health, there was also a predominance of observational studies (Cross-sectionals, Cohort, Case-Control Studies) (37.8%) followed by Qualitative Studies (33.4%); Narrative Reviews (17.2%); Editorial, Letter to Editor, Proceedings (6.6%); Systematic Reviews (2.8%); Clinical Trials (1.3%); and Quasi Experimental Studies (0.9%). Graphics 1A and 1B show the types of articles over the years. In Graphic 1A, looking for the total of articles, there is a constant relationship between each type, always with a predominance of quantitative (cross-sectional, cohort, case-control, trials) followed by qualitative studies. 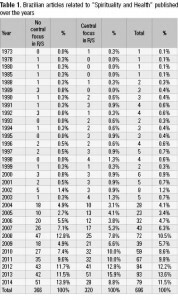 In Graphic 1B, analyzing only studies with central focus in R/S, there was a predominance of qualitative studies until the year of 2011. In 2012, an important increase in quantitative studies is observed followed by an important decrease in qualitative studies in 2014. 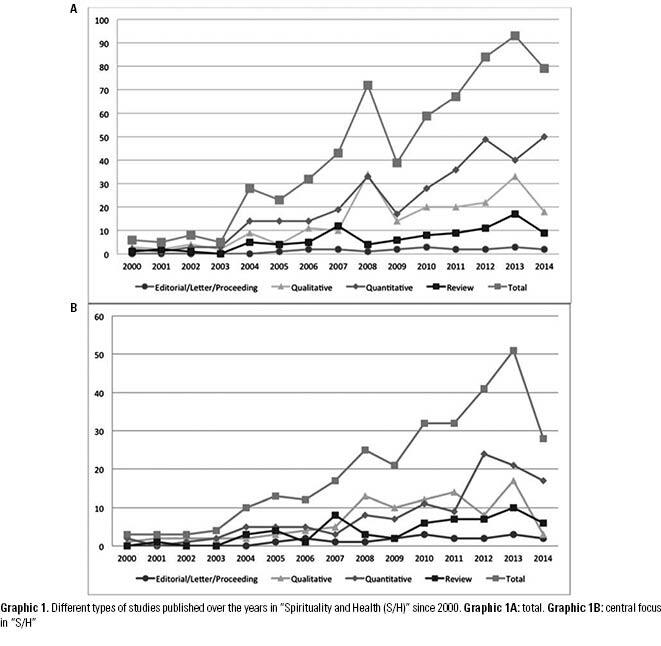 This decrease in qualitative manuscripts helped the general drop in publication that we can see in Graphics 1A and 1B. 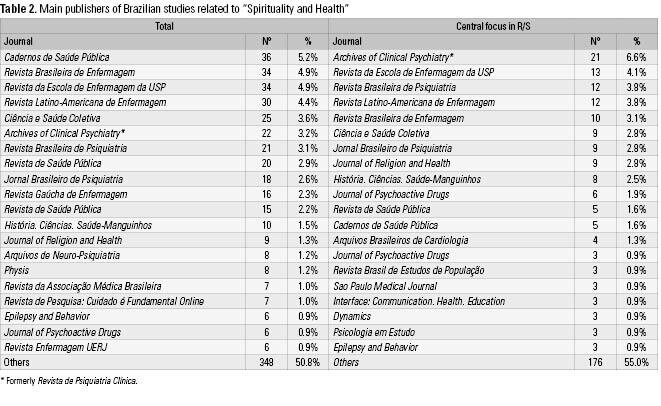 This bibliometrical study enabled us to widen our understanding about how the field of “spirituality, religion and health” has been established and how this field is increasing in Brazil, particularly in the last decade. We found a predominance of mental health issues, besides that most articles are observational and most journals are from the field of psychiatry, public health and nursing. Our findings provide further evidence to other studies, which have found an increase in the publication of articles related to R/S and Health in the last decades3,4,15. Brazil, according to a recent analysis4, is now the fifth greater publisher of articles in this area worldwide. However, to our knowledge, no other study has conducted a bibliometric analysis including only Brazilian manuscripts concerning R/S, and its variation over the years. We found an impressive increase of articles related to R/S published in the last decade. In Brazil, the major leap started between 2003 and 2004, and kept almost constant until 2014, when had a decline. One possible explanation might be that in 2003, Brazil hosted an International Congress in Spirituality and Health with Dr. Harold G. Koenig (one of the most prominent researchers in this field) as a keynote speaker. This event brought a lot of media coverage, including important magazine and TV interviews16. Both facts could have helped to spread the research in this area. Although the number of articles is important to establish any field of research, the study design is also important to consolidate it, particularly in the field of R/S, which is usually subjected to criticism and controversy17,18. Our findings reveal a great number of cross-sectionals, case-control and cohort studies, which is encouraging. Nevertheless, few studies were experimental (Quasi-experimental or Clinical Trials). Other articles have already investigated the influence of R/S in experimental studies showing promising outcomes19,20; therefore, we suggest that more studies using experimental protocols should be done in Brazil. In relation to the academic area of these articles, we found a relevant trend with 30% of articles related with psychiatry and mental health, much less than the 80% found in a review of world publication on R/S and health3. This shows that in Brazil the interest seems to be more widespread in other academic areas. Public Health represents a significant amount of published articles, through epidemiological studies and nursing, through qualitative studies. However, it suggests the need of more studies in other medical and health related areas. When talking about the main topics addressed by these articles, alcohol and/or drug use represents the most common issue, showing the importance of this subject in R/S field21,22. Noteworthy, ayahuasca appeared as the second most cited in articles with central focus in R/S. Possible explanations are the increase interest for this issue throughout the world, particularly in Brazil, where the religions that use ayahuasca in rituals were developed, and the crescent demand to understand the users and the neuropsychiatric effects of this plant23. R/S scales were in the third position (revealing some efforts to provide safe measures for these constructs, as noted by a previous systematic review)24, followed by Health education in the forth place (showing an attempt to integrate R/S in higher education)13. Finally, due to the relevance of the mental health to the field of R/S and Health, some of the most prominent journals in this area were psychiatry journals. When analyzing only studies with central focus in R/S, the Archives of Clinical Psychiatry/former “Revista de Psiquiatria Clínica”, is the leading journal in the total amount of articles. The relevance of Archives of Clinical Psychiatry has been already discussed by other authors15, stressing the essential role of this journal to the development of this area. 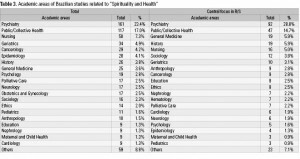 Other journals are also important tools for the expansion of this subject, noting that some articles from public health journals usually measure spirituality/religiosity variables, but this is not the main focus of the study25,26 and nursing journals usually are more likely to accept articles with qualitative data27, which represent a great number of R/S publications. Our study has some limitations. First, it is possible that some articles were not indexed in any of the electronic databases we have searched. However, by large, most relevant Brazilian academic papers are indexed in at least one of the searched databases. Moreover, trying to minimize this problem, we included BVS, which includes Lilacs (Literatura Latino-Americana e do Caribe em Ciências da Saúde) and SciELO (Scientific Electronic Library Online), the two most important databases for Brazilian papers. Second, it is possible that some R/S studies were not included due to a selection bias. In order to minimize this limitation, three reviewers assessed each article and their intra-class correlation was high. Third, there are some concerns regarding the incomplete data provided by some databases. We tried to minimize this problem searching for full-text versions of the articles. The field of “Spirituality, Religiosity, and Health” is increasing throughout the world, with Brazil being one of the leading countries in this field of research. We found an increase of articles in the last decade, with a predominance of quantitative data, addressing mental health issues and published in Brazilian journals from the field of psychiatry, public health and nursing. These findings can help in the development of future studies in Brazil. Lucas A. Costa and Marcos Túlio S. A. Viana received scholarship from Capes. 1. Koenig HG, McCullough ME, Larson DB. Handbook of religion and health. New York: Oxford University Press; 2001. 2. Lucchetti G, Koenig HG, Pinsky I, Laranjeira R, Vallada H. Spirituality or religiosity: is there any difference? Rev Bras Psiquiatr. 2015;37(1):83. 3. Koenig HG. Religion, spirituality, and health: the research and clinical implications. ISRN Psychiatry. 2012;2012:278730. 4. Lucchetti G, Lucchetti AL. Spirituality, religion, and health: over the last 15 years of field research (1999-2013). Int J Psychiatry Med. 2014;48(3):199-215. 5. Moreira-Almeida A, Koenig HG, Lucchetti G. Clinical implications of spirituality to mental health: review of evidence and practical guidelines. Rev Bras Psiquiatr. 2014;36(2):176-82. 6. Bonelli RM, Koenig HG. Mental disorders, religion and spirituality 1990 to 2010: a systematic evidence-based review. J Relig Health. 2013;52(2):657-73. 7. Snider A-M, McPhedran S. Religiosity, spirituality, mental health, and mental health treatment outcomes in Australia: a systematic literature review. Ment Health Relig Cult. 2014;17(6):568-81. 8. Dalgalarrondo P. Brazilian studies on religion and mental health: history and current perspectives. Rev Psiquiatr Clin. 2007;34(1):25-33. 9. Moreira-Almeida A, Neto FL, Koenig HG. Religiousness and mental health: a review. Rev Bras Psiquiatr. 2006;28(3):242-50. 10. Guimarães HP, Avezum A. O impacto da espiritualidade na saúde física. Rev Psiquiatr Clin. 2007;34 Supl 1:88-94. 11. Lucchetti G, Lucchetti AL, Koenig HG. 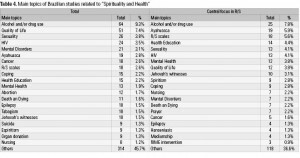 Impact of spirituality/religiosity on mortality: comparison with other health interventions. Explore (NY). 2011;7(4):234-8. 12. Panzini RG, Bandeira DR. Spiritual/religious coping. Rev Psiquiatr Clin. 2007;34 Supl 1:126-35. 13. Lucchetti G, Lucchetti AL, Espinha DC, de Oliveira LR, Leite JR, Koenig HG. Spirituality and health in the curricula of medical schools in Brazil. BMC Med Educ. 2012;12:78. 14. Lucchetti G, de Oliveira LR, Koenig HG, Leite JR, Lucchetti AL. Medical students, spirituality and religiosity: results from the multicenter study SBRAME. BMC Med Educ. 2013;13:162. 15. Moreira-Almeida A. The growing impact of publications in spirituality and health and the role of Revista de Psiquiatria Clínica. Rev Psiquiatr Clin. 2010;37(2):41-2. 16. IV Congresso Medinesp 2003. [cited 2015 August 21st]. Available from: <http://www.amebrasil.org.br/html/med03.htm>. 17. Sloan RP, Bagiella E, Powell T. Religion, spirituality, and medicine. Lancet. 1999;353(9153):664-7. 18. Dein S, Cook CCH, Koenig H. Religion, spirituality, and mental health: current controversies and future directions. J Nerv Ment Dis. 2012;200(10):852-5. 19. Gonçalves JP, Lucchetti G, Menezes PR, Vallada H. Religious and spiritual interventions in mental health care: a systematic review and meta-analysis of randomized controlled clinical trials. Psychol Med. 2015;45(14):2937-49. 20. Townsend M, Kladder V, Ayele H, Mulligan T. Systematic review of clinical trials examining the effects of religion on health. South Med J. 2002;95(12):1429-34. 21. Sanchez ZM, Nappo SA. Religiosity, spirituality and psychotropic drug use. Rev Psiquiatr Clin. 2007;34 Supl 1:73-81. 22. Castaldelli-Maia JM, Bhugra D. Investigating the interlinkages of alcohol use and misuse, spirituality and culture – Insights from a systematic review. Int Rev Psychiatry. 2014;26(3):352-67. 23. Bouso JC, González D, Fondevila S, Cutchet M, Fernández X, Ribeiro Barbosa PC, et al. Personality, psychopathology, life attitudes and neuropsychological performance among ritual users of ayahuasca: a longitudinal study. PLoS One. 2012;7(8):e42421. 24. Lucchetti G, Lucchetti AL, Vallada H. Measuring spirituality and religiosity in clinical research: a systematic review of instruments available in the Portuguese language. Sao Paulo Med J. 2013;131(2):112-22. 25. Assumpção D, Domene SM, Fisberg RM, Barros MB. [Diet quality and associated factors among the elderly: a population-based study in Campinas, Sao Paulo State, Brazil]. Cad Saude Publica. 2014;30(8):1680-94. 26. Barros FC, Melo AP, Cournos F, Cherchiglia ML, Peixoto ER, Guimarães MD. Cigarette smoking among psychiatric patients in Brazil. Cad Saude Publica. 2014;30(6):1195-206. 27. 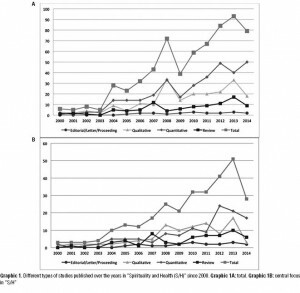 Gagliardi AR, Umoquit M, Webster F, Dobrow M. Qualitative research publication rates in top-ranked nursing journals: 2002-2011. Nurs Res. 2014;63(3):221-7.